At a very young age I began observing the world around me through a camera lens. I was instantly fascinated by the idea that a moment in time could be frozen forever by the push of a button. Later in life I began training as an architect, but I was unable to escape the pull of the camera, so it naturally became the tool I used to observe the built environment. Rather then photographing people I became obsessed with the physicality of place and the objects that occupied that space. The photographs included in INPHA are part of two recent bodies of work that explore the effects of mechanized building practices on the built environment, particularly in the rural and residential vernacular. The work is intended to provoke the viewer to consider how ready-made structures affect traditional building practices in the American landscape. The negative space within the images is physically created with a computer driven laser cutter. Each void is precisely inscribed in the paper, removing the object from the surrounding landscape. 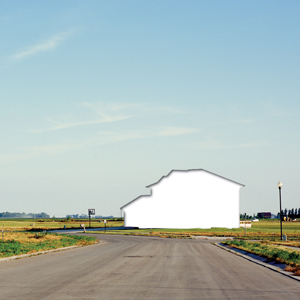 While the process works on a conceptual level to describe the diminishing existence of hand crafted architecture in the rural and suburban landscape, it effectively transforms the two-dimensional image into a three-dimensional object. This is part of a larger interest to explore the physicality of the photographic image, to push the boundaries of the dimensionality of the photograph into the realm of object. For image capture I work with film. I can‚t resist the physicality of the negative and the reaction it has with light. As the photographic world transforms into a more digital and manipulated field I found myself looking for ways to work with digital tools while maintaining a physical base. The application of the computer driven laser cutter to the physical print has enabled me to use a digital means to manipulate the final image through cutting, folding, and etching and in turn create an object out of the otherwise flat image plane. I am continually fascinated by the process of taking a three-dimensional object, transforming it into a two-dimensional image plane, and then different ways to return this scene to the third dimension. As my work becomes more and more sculptural, it is the photographic image that remains the basis of what I make.